This book is the first of its kind, which presents the great work of Dr. DD Basu in the form of a workbook, supplementing his classic work with additional information. This book is for everyone preparing for competitive exams held by the Union and State Public Service Commissions, presenting elaborate insight into the Indian Constitution. It further incorporates all the latest amendments to the Constitution including materials & figures not included in any publication so far on the subject. It also contains elaborate comments on separatism in Punjab, Assam & elsewhere.The workbook provides additional information to the fine work of the Author, in the form of MCQ’s, history, explanations, info links, definitions, critical information, important case laws, etc. 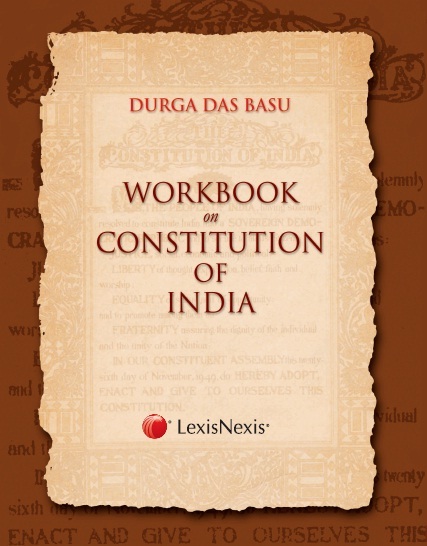 While the Author’s commentary on the Constitution of India and the shorter Constitution annotates the Constitution Article by Article, primarily from the legal standpoint, the present workbook further elaborates in depth the critical information’s on such subjects. This work book will supply the long felt need for an extensive study on the Constitution for the general readers, politicians as well as students and candidates preparing for the Public Service Commission and other competitive examinations. It traces the Constitutional history of India since the Government of India Act, 1935; analyses the provisions of the present Constitution and explains the inter-relation between its diverse contents. The status of Jammu and Kashmir and the provisions of its State Constitution have been fully dealt with. It gives an account of the working of each of the provisions of the Constitution during its first decade with reference to statutes and decisions wherever necessary, together with the critical estimate of its trends. This book is an innovative initiative which aims at adding comprehensive element and creative concepts, making this workbook extensive in its coverage. This book aims at covering the over-all developments in the constitution with latest updates.